Directions to this Site: If you are coming from the east (say Halifax), take exit 18A from Highway 101 (Main Street) and turn left or south on Victoria Road. Travel 1.3 km south to Highway 1 (Main Street) and turn right or SW on it. 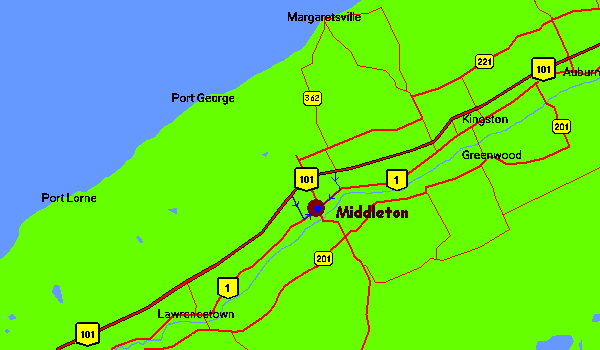 Travel 1.8 km and you are in the centre of Middleton, the Heart of the Valley. From there, the three sites mentioned in the text are all easily accessible. If you are coming from the west (say Yarmouth), take exit 18 from Highway 101. Turn right or SSE onto Brooklyn Road and proceed 1.6 km to Highway 1 (Main Street). Turn left or ENE on Highway 1 (Main Street) and go 1.2 km to the centre of Middleton, the Heart of the Valley. From there, the three sites mentioned in the text are all easily accessible. 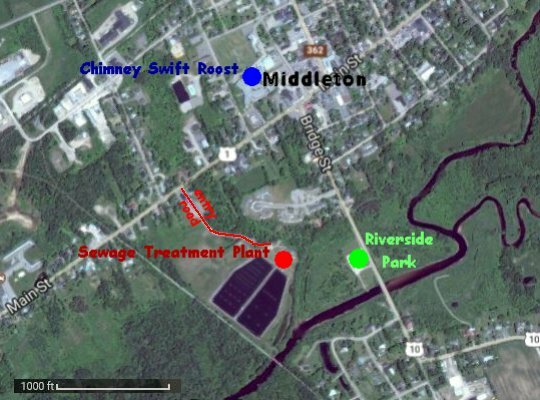 Middleton Site Map: Middleton has three sites of interest in close proximity to the centre of town (herein the corner of Main & Commercial Streets): Riverside Park, the Sewage Treatment Plant and the Chimney Swift Roost. The map below shows the location of each of these attractions. Site Description and Birding Information: The closest to "downtown" is the Chimney Swift Roost, so we'll start there. From the town centre (Main & Commercial Streets) go WSW 300 metres to Gates Avenue. 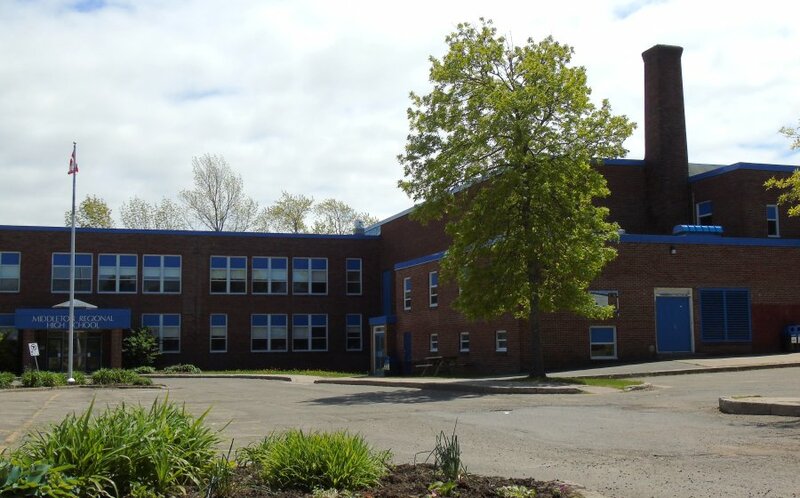 Turn right or NNW and go 180 metres to the entry on the right to the Middleton Regional High School. Drive in to where you have a good view of the chimney. This site is known for a single species (Chimney Swift) and is only worth a visit at dusk - to see them return to their roost. About 100 swifts can be seen to dive into the chimney at the high school within a few moments of each other each night during their short breeding season (mid to late May until early July). Riverside Park is a small greenspace along the Annapolis River just south of town. From the town centre (Main & Commercial Streets) go WSW 120 metres to Bridge Street or Highway 10. Turn left or SSE and go 500 metres to the entry on the right to the parking area at Riverside Park. This site is relatively new and is mostly bushes and tangles, with a small amount of larger trees in the park proper and lines of taller trees separating the park from the housing to the north and the sewage lagoons to the west. The Annapolis River forms the southern bound of the park and hence has the usual fishermen's paths. The park itself has a shorter doubled loop and a longer loop outside that. The tangles directly to the west of the parking lot and off the north edge of it are both good for skulking birds, especially in the autumn. A Yellow-breasted Chat appeared in both of these thickets in the fall of 2016. Off the west end of the inner loop is a small copse of trees that seems to be the best spot for fall migrants, especially warblers. 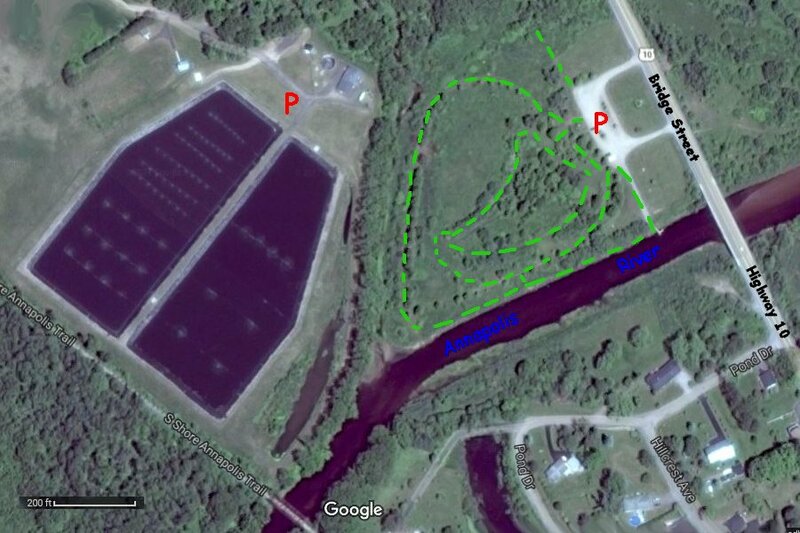 The map below shows more details regarding the park and adjacent sewage lagoons. That brings us to the Middleton Sewage Treatment Plant. It can be reached by going WSW 550 metres from the town centre (Main & Commercial Streets) along Main Street until you reach St. John's United Church on the left. Turn into the parking lot just east of the church and drive through it to the rear (this is the road into the lagoons!). There is a gate at the rear of the parking lot, which is left open during working hours on weekdays. Drive in about 400 metres from Main Street to the lagoons. There are two ponds both of which may be viewed from here. Remember that this is a working operation, so park off to the side if you leave your car and stay clear of any activity. There are two sliver ponds east of the lagoons which attract a variety of birds. 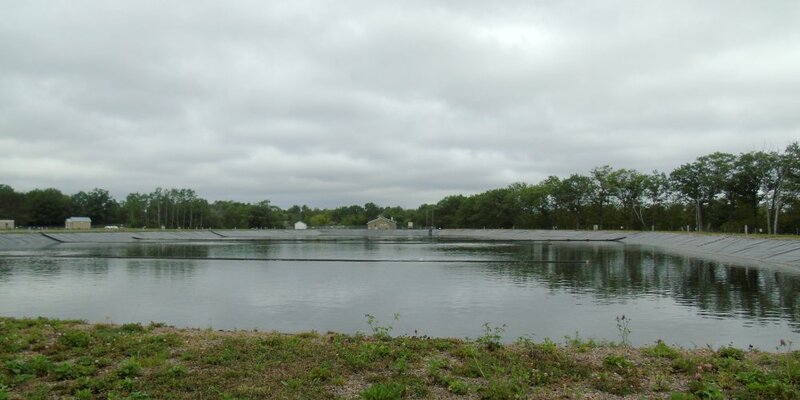 The lagoons are plastic wrapped so don't expect too much, but there are Mallard, Wood Duck, Double-crested Cormorant, Spotted Sandpiper, swallows and gulls during the spring through fall period. And who knows what may show up. The South Shore - Annapolis Rail Trail passes along the SW end of the lagoons. 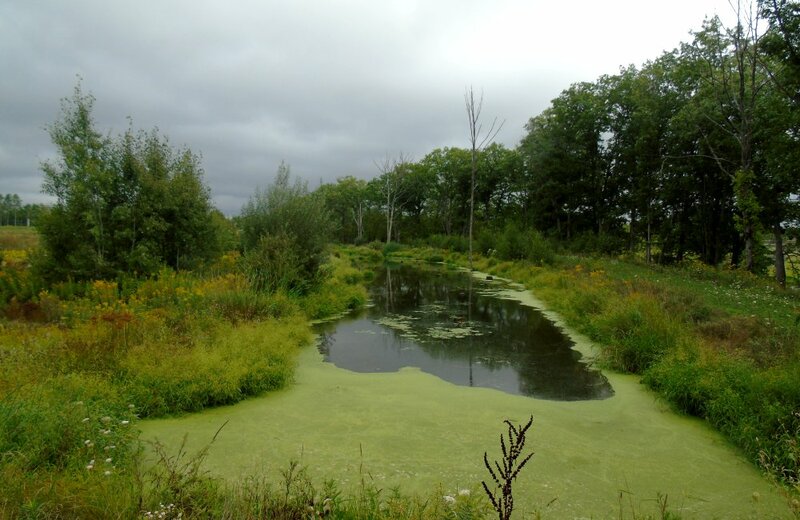 The ponds can be reached easily from there, as well.